Genuine Lotus Air Filter. To Suit Lotus Elise or Exige with Toyota 2ZZ-GE Engine Part Num..
Auxillary Belt Tensioner. 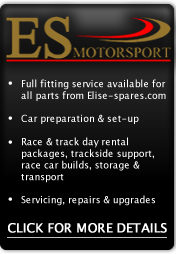 To suit all Toyota Powered Lotus Elise, Exige & 2-11. .. Baffled Sump to suit Lotus Elise S2, Exige S2 and 2-Eleven with Toyota 2ZZ Engines. We take a..
Lotus Elise Exige 2-Eleven Toyota 2ZZ Cam Lift Bolts (pair). To suit all Toyota Powered Lotus.. Clutch release bearing to suit all 2ZZ Toyota Engined Lotus Elise or Exige Cars with 6 Speed Gear..
Drive belt for alternator & water pump to suit the 2ZZ Toyota engines Lotus Elise R & 111.. Exhaust manifold to cylinder head gasket. To suit Lotus Elise S2, Exige S2 and 2-Eleven with ..
Genuine Toyota Head Gasket Set. To suit Lotus Elise, Exige and 2-Eleven with Toyota Engine. ..
Set of 10 cylinder head bolts. These are stretch bolts and need replacing every time the cyli..
Head Gasket Set. To suit Lotus Elise, Exige and 2-Eleven with Toyota 2ZZ Engine. ..
Head Gasket. To suit Lotus Elise, Exige and 2-Eleven with Toyota Engine. ..
Intake manifold to cylinder head gasket. To suit Lotus Elise S2, Exige S2 and 2-Eleven with T.. Performance ITG Profiler Air Filter. To suit Lotus Elise or Exige with Toyota 2ZZ Engine. .. Knock Control Sensor To Suit All Lotus Elise Exige S2 Toyota 2ZZ Engined Models ..